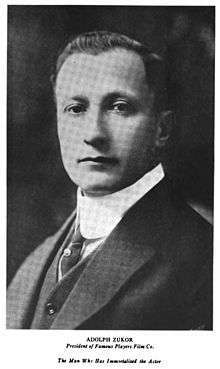 Adolph Zukor (January 7, 1873 – June 10, 1976) was an American film mogul and founder of Paramount Pictures. Zukor was born to a Jewish family in Ricse, Hungary, which was then a part of the Austro-Hungarian empire. In 1889, at the age of 16, he promised Mella Baumoel, a girl almost 4 years older than he, that he would send for her one day and they would be married, and he emigrated to the United States. Like most immigrants, he began modestly. When he first landed in New York, he stayed with his family and worked in an upholstery shop. A friend got him a job as an apprentice at a furrier. Mella arrived in the U.S. too late to wed him; they never spoke again. Zukor stayed there for two years. When he left to become a "contract" worker, sewing fur pieces and selling them himself, he was nineteen years old and an accomplished designer. He was young and adventuresome, and the 1893 Columbian Exposition in Chicago drew him to the Midwest. There he started a fur business. In the second season of operation, Zukor's Novelty Fur Company expanded to 25 men and opened a branch. Historian Neal Gabler wrote, "one of the stubborn fallacies of movie history is that the men who created the film industry were all impoverished young vulgarians..." Zukor clearly didn't fit this profile. By 1903, he already looked and lived like a wealthy young burgher, and he certainly earned the income of one. He had a commodious apartment at 111th Street and Seventh Avenue in New York City's wealthy German-Jewish section". In 1918, he moved to New City, Rockland County, New York, where he purchased 300 acres of land from Lawrence Abraham, heir to the A&S Department Stores. Abraham had already built a sizable house, a nine-hole golf course and a swimming pool on this property. Two years later, Zukor bought an additional 500 acres, built a night house, guest house, movie theater, locker room, greenhouses, garages, staff quarters and hired golf architect A.W. Tillinghast to build an 18-hole championship golf course. Today, Zukor's estate is the private country club Paramount Country Club. He became involved in the motion picture industry when in 1903 his cousin, Max Goldstein approached him for a loan. Mitchell Mark needed investors to expand his chain of similar theaters that began in Buffalo, New York with Edisonia Hall. The arcade salon, the Automatic Vaudeville Company on 14th Street in New York City was to feature Thomas Edison's marvels: phonographs, electric lights and moving pictures. Zukor not only gave Goldstein the money but insisted on forming a partnership to open another one. Another partner in the venture was Marcus Loew. Zukor is honored with a dinner marking his 25 years in the film industry in 1936. From left: Frank Lloyd, Joseph M. Schenck, George Jessel, Zukor, Darryl F. Zanuck, Louis B. Mayer, and Jesse L. Lasky. In 1912, Adolph Zukor established Famous Players Film Company—advertising "Famous Players in Famous Plays"—as the American distribution company for the French film production Les Amours de la reine Élisabeth starring Sarah Bernhardt. The following year he obtained the financial backing of the Frohman brothers, the powerful New York City theatre impresarios. Their primary goal was to bring noted stage actors to the screen and Zukor went on to produce The Prisoner of Zenda (1913). He purchased an armory on 26th Street in Manhattan and converted it into Chelsea Studios, a movie studio that is still used today. The studio evolved into Famous Players-Lasky with co-producer Jesse L. Lasky. The Paramount Pictures Corporation was formed to distribute films made by Famous Players-Lasky, and a dozen smaller companies pulled into Mr. Zukor's corporate giant. The consolidations led to formation of a nationwide film distribution system. And in 1919, the company bought 135 theaters in the Southern states, making the producing concern the first that guaranteed exhibition of its own product in its own theaters. He revolutionized the film industry by organizing production, distribution, and exhibition within a single company. Zukor shed most of his early partners; the Frohman brothers, Hodkinson and Goldwyn were out by 1917. Zukor believed in stars. He signed many of the leading early stars, including Mary Pickford, Marguerite Clark, Pauline Frederick, Douglas Fairbanks, Gloria Swanson, Rudolph Valentino, and Wallace Reid. With so many important players, Zukor also pioneered "block booking" for Paramount Pictures, which meant that an exhibitor who wanted a particular star's films had to buy a year's worth of other Paramount productions. It was this system that gave Paramount a leading position in the 1920s and 1930s, but which led the government to pursue it on antitrust grounds for more than twenty years. Zukor was the driving force behind Paramount's success. Through the teens and twenties, he also built the Publix Theatres Corporation, a chain of nearly 2,000 screens. He also ran two production studios, one in Astoria, New York (now the Kaufman Astoria Studios) and the other in Hollywood, California. In 1926, Zukor hired independent producer B. P. Schulberg, who had an unerring eye for new talent, to run the new West Coast operations. They purchased the Robert Brunton Studios, a 26-acre facility at 5451 Marathon Street for US$1 million. In 1927, Famous Players-Lasky took the name Paramount Famous Lasky Corporation. Three years later, because of the importance of the Publix Theatres, it became Paramount Publix Corporation. Zukor was now turning out 60 features a year. He made deals to show them all in theaters controlled by Loew's Enterprises, and also continued to add more theaters to his own chain. By 1920 he was in a position to charge what he wished for film rentals. Thus he pioneered the concept, now the accepted practice in the film industry, by which the distributor charges the exhibitor a percentage of box-office receipts. Zukor, ever the impresario, bought a huge plot of ground at Broadway and 43d Street, over objections of his board of directors, to build the Paramount Theater and office building, a 39-story building that had its grand opening in 1926. He managed to keep stars like Pola Negri, Gloria Swanson, and most important of all, Mary Pickford, under contract and happy to stay at Paramount. At one point Miss Pickford told Zukor: "You know, for years I've dreamed of making $20,000 a year before I was 20, and I'll be 20 very soon." "I could take a hint," Zukor recalled wryly. "She got the $20,000, and before long I was paying her $100,000 a year. Mary was a terrific businessman." Zukor was, primarily, also a businessman. "He did not take the same personal, down-to- the-last-detail interest in the making of his movies that producer-executives such as Samuel Goldwyn and Louis B. Mayer did," wrote the New York Times in Zukor's obit at the age of 103. He became an early investor in radio, taking a 50% interest in the new Columbia Broadcasting System in 1928, but selling it within a few years. Partner Lasky hung on until 1932, when Paramount nearly collapsed in the Depression years, and he was blamed for this and tossed out. The following year, Paramount went into receivership. Zukor's over-expansion and use of overvalued Paramount stock for purchases were ultimately at fault. A bank-mandated reorganization team kept the company intact, and, miraculously, Zukor was kept on. In 1935, Paramount-Publix theater chain went bankrupt. In 1936, Barney Balaban became president, and Zukor was bumped up to chairman of the board. In this role, Zukor reorganized the company as Paramount Pictures, Inc. and was able to successfully bring the studio out of bankruptcy. He eventually spent most of his time in New York, but spent the winter months in Hollywood to check on his studio. He served as president until 1936 when he was elevated to chairman of the board, later followed by honorary chairman. He retired from Paramount Pictures in 1959 and thereafter assumed Chairman Emeritus status, a position he held up until his death at the age of 103 in Los Angeles. In 1897, he married Lottie Kaufman; they had two children, Eugene J. Zukor, who became a Paramount executive in 1916, and Mildred Zukor Loew who married Arthur Loew, son of Marcus Loew. Zukor died at his Los Angeles residence at age 103. The composition at Juhász-kút (Sheperd Well) is one of the sights of Ricse. The well and its composition was given to the village by Adolph Zukor, who was born here. ↑ Bernstein, Matthew (February 2000). Zukor, Adolph. American National Biography Online. Oxford University Press. ↑ Obituary Variety (June 16, 1976), page 76. 1 2 Gabler, Neal (1988). An empire of their own: how the Jews invented Hollywood (1st ed.). New York: Crown Publishers. p. 16. ISBN 0-517-56808-X. ↑ Trager, James (1979). The people's chronology: a year-by-year record of human events from prehistory to the present. Austin, Texas, United States: Holt, Rinehart and Winston. p. 823. ↑ Wu, Tim, The Master Switch : The Rise and Fall of Information Empires, New York : Alfred A. Knopf, 2010. ISBN 978-0-307-26993-5. Cf. especially p.62 on the film and Sarah Bernhardt. Sections of the book are on the film industry's early days and the then independent film studios such as Paramount. ↑ Ingham, John N. (1983). Biographical Dictionary of American Business Leaders, Volume 4. Greenwood. p. 1702. ISBN 978-0313239106. Wikimedia Commons has media related to Adolph Zukor.